You don't have to follow the yellow brick road to find this emerald jewel. All kinds of gorgeous greens fill this 8" basket that makes a perfect sympathy gift. 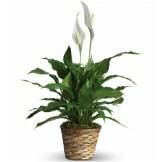 So beautiful and bountiful it will deliver your condolences eloquently. 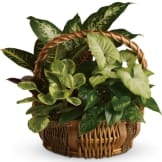 • Pothos, nephthytis, dieffenbachia, croton and peperomia plants are perfectly arranged in a distinctive willow rope basket. 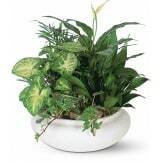 • This basket measures approximately 17 1/2" W X 17 1/4" H.